I have just not been riding enough lately and am not in even the fairly pathetic shape I normally am. So I had to make a judgement on Friday. Do I do a long, hard ride to help get me back in shape, or hold back a little to not overdo it for Saturday? We'd been having a lot of rain, so instead of mountain biking, I rode 35 miles on the paved W&OD trail. Though it wasn't a "hard" ride, it was enough that I knew it was going to have a little effect on me the next day. Saturday morning I drove the 2-1/2 hours to get to the Stokesville Campground (western Virginia). At 1:30, there was to be a "Women's Ride/Clinic." Indeed, there were 34 women for the ride, and 4 leaders. I looked up the leaders on the web ahead of time. One woman missed qualifying for the Olympic team by 1 point. The other two women were racers. Not quite so good, but pretty darn good. Then I didn't find much on the 4th. Of course once I get there, I have a hard time remembering who the leaders are, what they're names are, and what they look like. *All* the racers were named "Sue." We headed off in a giant pack up the gravel road to where we took some double track up the mountain to Narrowback Ridge. It was in the vicinity of the place I went riding with MORE on Memorial Day weekend. When we got tothe doubletrack I, we split into a pack of 3 smaller groups (and I changed the batteries in my GPS and turned it one). 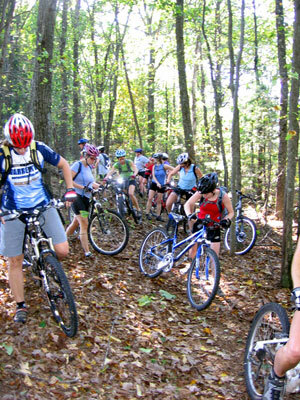 The first and largest group were the "good" folks who just wanted to head off having a lovely good ride together. I was in the second group who had some skill but might like to stop now and again and learn some skills. 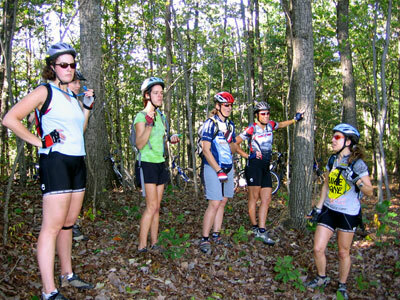 The third group were the gals who had little skill on singletrack. I warned the women that I was slow, and when the leader (Sue Musante) said she didn't have anyone to sweep, I volunteered, saying I was an expert. As we rode along, I noticed I was more technically proficient than then the couple women in front of me. I had no problems with hopping little logs across the trail. Nor did I have trouble with the little rock gardens that weren't very bad at all. Yet, as I'm in worse shape than normal, I did have trouble keeping up with the group. We came to one big log and when we got there, we had a chance to practice at it. Most gals didn't try. It freaked me out, but I sort of tried, but didn't succeed. Not too far later, there was another log, just a little smaller. The idea was to lift your front tire onto the log and hop over. Well, I did what I always do, now by instinct. I hopped my entire tire completely over the log. I wound up falling over, too, but I think that was more because of all the commotion than if I'd been there by myself. 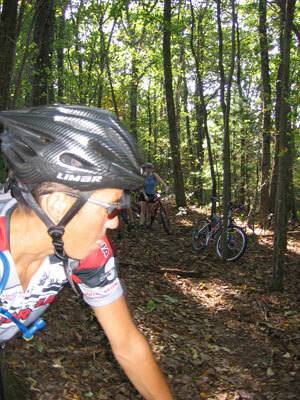 We rode some more very nice singletrack on top of the mountain ridgetop. Then we veered off down to join the doubletrack that paralleled the ridge, but part way down. There was a moderately big log, then a log pyramid. At first I didn't hop the log, because there was a pile up of people ahead of me and I didn't have momentum. Ultimately I backed up, hopped the first log. But the pyramid freaked me out (but then, that was part of why I was there, to learn to do these exact features). I managed to ride up with two of the Sues (Musante and George) spotting me, but then I kind of endoed off the top. So see! To Chris and all those people who don't believe me, I just seem to screw up a lot and I am by nature a klutz. Somewhere along the line, I formulate that for single logs, perhaps I need to learn to practice my timing to get my front tire to land directly on the top of the log. I will start practicing somewhere with a little bitty 2-3" log getting the timing and technique down for that. All was fine going back until the little hill going back up to the campground. Whew! I walked up the hill--I was beat. It was about 5-1/2 hours after we started. I hung out, helping a little with the dinner. I talked briefly with Rich Edwards. And the only person I really knew was Carl Droms, the caver. When we got our dinner of chicken burritos, I ate with Carl and his friends, who turned out to be two women I spent time chatting with at the very beginning riding up the gravel road. One is a stellar triathlete who is just learning mtbing. The opposite of me. I've got some skills and no fitness. She's terrifically fit with no skill. If I recall, her name is Connie and she looks like my friend Cheryl. The other lady worked at a bike store in Harrisonburg. Another young woman name MK was with the group, too. On and on we go along the doubletrack fireroad. I'm definitely tired. We get to the turn off to climb the single track back up to the top of the ridge. Around this time I start to look at the track in my GPS (I'd turned it on when we left the gravel road when we started, unfortunately not when we'd left the campground). I could see on it where the trail I was on would reach the trail we'd ridden down the ridge before. But I was starting to bonk. I ate a Luna bar, but I think I was toast anyway. We then blasted downhill on the same trail we took last Memorial Day weekend. I wound up right in front of the near-Olympic Sue (Haywood). She made a comment to the people in earshot she wanted to see good technique with elbows bent snapping off tree branches. There was a stoppage up ahead, so I went to pull over to wait, and ask Sue if she had any tips or constructive criticism on my technique. Right then I fell over! How embarrassing! Good thing I have no pretext at being good. Normally I'm not THAT klutzy, but there you go. She only commented that she recommended we compress down before the waterbars. To try and save my bruised ego, I had to relate the story of a guy I know (Noel Sloan) went on a skiing trip and came back with a broken arm with pins sticking out. He broke his arm at the bottom of the mountain. He was standing in line for the ski lift oggling a woman when he fell over and broke it. Sue marveled that he actually admitted it. She got ahead of me and I marveled as she jumped up on a giant log at a stream crossing. Soon we hit the gravel road and she and I chatted a bit on the downhill. She is a full-time sponsored racer. I'd read on the web that she's based out of Davis, WV. But when I asked, she said she spent 3 months in winter in Tucson. I'd gone to Tucson last February for a mini mtb vacation, so I thought that was great. All was fine going back until the little hill going back up to the campground (checking my GPS at home we rode up 2114', not including the first long gravel stretch!). Whew! I walked up the hill--I was beat. It was about 5-1/2 hours after we started. I hung out, helping a little with the dinner. I talked briefly with Rich Edwards. And the only person I really knew was Carl Droms, the caver. When we got our dinner of chicken burritos, I ate with Carl and his friends, who turned out to be two women I spent time chatting with at the very beginning riding up the gravel road. One is a stellar triathlete who is just learning mtbing. The opposite of me. I've got some skills and no fitness. She's terrifically fit with no skill. If I recall, her name is Connie and she looks like my friend Cheryl. 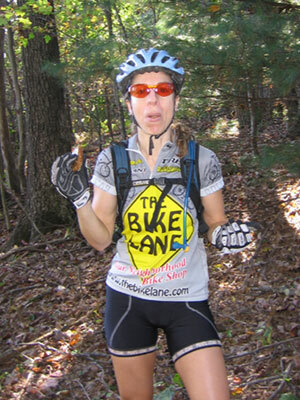 The other lady worked at a bike store in Harrisonburg. Another young woman name MK was with the group, too. I managed to corner Sue George (since Sue Musante wasn't nearby and was whom I'd started the conversation with). Is it a good plan to practice setting my front wheel on top of logs? In particular as a pretext to learning how to do it over big logs? Yes. And then, what do I do about my back tire? The plan there is to hop the back tire so it lands with the wheel on top of the log, and then the bike will just roll off it. Great! I've got a plan! Then I headed back home, just before 8 pm. But I was still hungry after my one burrito which was largely veggies, so I stopped at McDonalds in Bridgewater and got a cheeseburger and small fries. Hit the spot, though I felt guilty afterward. As has happened from time to time on my way back from weekends west, I bonked on the drive back. I had to pull off at an exit midway back on I-66 and take a nap. I snoozed for about a half hour, then back on the way I went. Not counting the nap, it too me 2:20 overall for the drive. :56 from I-81 to home, and :19 from Gainsville home. As I type this up on Sunday, I seem to have developed a cold. I first noticed some symptoms on Friday. I'm soooo sleepy today. I wonder if I can use this as an excuse for why I did so poorly on the ride yesterday??? My blood pressure is as low as it was when I was on Inderal, though my pulse is higher.